It is very gratifying to watch my sons eat their cereal and milk every morning; how with every spoonful their bodies awaken a little more. They might have dragged themselves to the kitchen table, but they usually leave with a skip in their step thanks to the nourishment they received. Milk is a key component of their breakfast. In fact, milk makes every meal more nutritious. It contains nine essential nutrients, including 8 grams of high-quality protein per 8-ounce serving and three of the top nutrients most likely to be missing in the American diet: calcium, vitamin D and potassium. Starting the morning with a nutritious breakfast that includes milk is a great way to get ready to tackle the day. I see the difference milk makes in my boys every morning. Sadly, perishable items such as milk, which many of us consider a staple, are absent from homes across the country because they are not available in many of America’s food banks. According to Feeding America, the nation’s largest domestic hunger-relief organization, milk is one of the items most requested by food bank clients, yet there is a nationwide shortage because it is rarely donated. (See infographic.) The refrigerated distribution logistics from warehouse to kitchen are very challenging. Feeding America participants currently receive the equivalent of less than one gallon of milk per person a year. That’s far short of the recommended three servings of milk a day. Many of us learned about this during the 2014 Dairy Forum in January. That is when the MilkPEP folks unveiled their new milk marketing campaigns, one of which is in collaboration with The National Dairy Council and is called The Great American Milk Drive. This first-ever national program is designed to help deliver highly desired and nutrient-rich gallons of milk to hungry families who need it most. You can access a video explaining the situation and the program HERE. Did you know that hunger impacts one in six Americans, including 12.5 million families who do not have access to adequate nourishment to help them reach their full potential? Hunger has no boundaries and is a problem that exists in urban, suburban and rural communities. When the MilkPEP team presented the campaign at Dairy Forum, I got goose bumps. This is one of the best feel-good programs I have heard about in a long time. I hope you agree. I also hope that all U.S. subscribers of the Daily Dose of Dairy get on board. 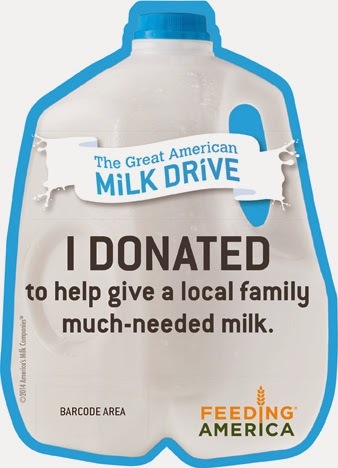 There are many ways for local milk companies and farm families to get involved with The Great American Milk Drive, including retail activations, on-pack promotions and social communications. You are cordially invited to hear more this Wednesday, April 2 at 11:45am EST during a live stream of the official launch of the campaign. You can experience this event by clicking HERE. The Great American Milk Drive brings the dairy industry together around the issue of hunger. 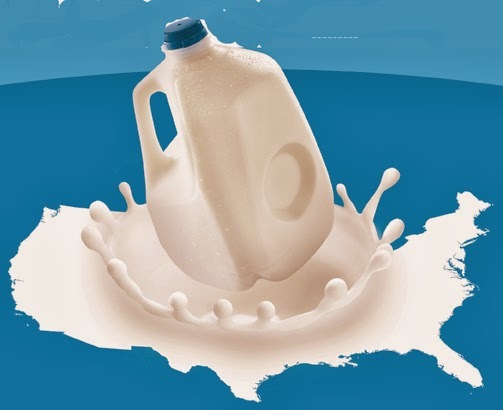 Together, MilkPEP and The National Dairy Council have created this national campaign to elevate awareness of the need for milk in the nation’s feeding programs, allowing milk companies and farm families to join in together to provide Americans a simple way to help. It’s a program that does good and helps the industry benefit, as well. The program is designed to encourage consumers to make a simple donation--purchasing an extra gallon of milk--that Feeding America will make sure gets on the table of local families who need it most. Here’s how the program works. It’s Americans feeding Americans. We the people can lend a hand and contribute nutritious milk to feed families in need. Initially the campaign will instruct Americans to make a financial donation via website site or text message. By entering their zip code, the milk donation goes to their own community’s food bank. Food bank clients will receive a voucher to purchase any brand and any type of gallon of milk (up to $5.00) at their retailer of choice. A robust national program (including TV advertising, retail support, social media and local events) will encourage Americans to support the drive. Over time, additional ways to donate will be made available. The tear pad is what I am most excited about. Milk marketers will work with their retailers to add a scan code to the tear pad. Shoppers can pick up a sheet, hand it to their cashier to be scanned and a have a donation added to their grocery bill. The donator’s name can then be added to the tear pad and displayed in recognition of their donation. Talk about a feel good…while you buy your own family a gallon of milk you can buy a gallon for a family in need. 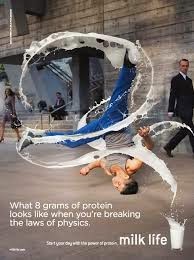 At the same time The Great American Milk Drive was unveiled in January, MilkPEP also introduced the Milk Life campaign, which is designed to promote the consumption of protein-rich milk at breakfast. Together, the two campaigns will “propel milk back into a position of power,” according to Julia Kadison, interim CEO of MilkPEP. “We know that to achieve this, milk has to have a really strong positioning. 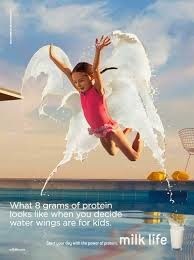 “Not only do we have to capture the minds of people by making sure they understand why it’s relevant and important for them to drink milk--and in 2014 and for the foreseeable future we will be talking about protein and the benefits of protein--but we also have to capture their hearts,” she said. Products like Cheez Whiz, Easy Cheese and Velveeta—all Kraft/Mondelez brands and actually quite yummy—are considered by many as being responsible for the bad rap that the term “process cheese” has among American consumers. All three products are often criticized for how little cheese they might contain. I’m not here to debase these products, because I have been known on occasion to squeeze some Easy Cheese right into my mouth. And…my favorite childhood lunchbox sandwich was white bread with a thick slice of Velveeta loaf and smashed nacho cheese Doritoes…all washed down with a carton of chocolate milk. The fact is, process cheese products can be clean label and natural, per definitions recognized by the industry. They are not “processed,” per the definition some consumers use interchangeably with “Frankenfoods” and laboratory experiments. The beauty of process cheese is that it serves as a beautiful base for innovative dairy foods formulators to add layers and layer of flavors. At IFT Wellness, which took place this week in Chicago, my friend Lu Ann Williams, director of innovation, Innova Market Insights, The Netherlands, shared this. “Process cheese is not flagged as such in most countries. In Europe, especially, such soft, spreadable cheeses are used as flavorful condiments in sandwiches. They are also used as dips and for snacking." Process cheese products are also highly regarded by prepared foods manufacturers and foodservice professionals, as these cheeses typically provide superior meltability and improved versatility in a wide array of applications, as compared to natural cheeses. The Code of Federal RegulationsMost natural cheeses, which are living systems that evolve over time in terms of flavor and texture, are made from only four ingredients: cultures, enzymes, milk and salt. In Title 21 Part 133 of the Code of Federal Regulations (CFR), FDA legally defines cheese and outlines the requirements for more than 90 standardized cheeses, including natural varieties such as cheddar and mozzarella, as well as various process cheeses, including those that undergo heat treatment as well as those comminuted without the aid of heat. Though natural cheeses can be and are used in food processing, more often than not, formulators rely on pasteurized cheeses. The heat treatment these cheeses undergo enables better control over functional properties. Pasteurized cheeses start out by blending a minimum amount of specified natural cheese with other ingredients, including those with emulsifying properties. The pasteurization (high-heat treatment) step deactivates the enzymes and cultures, which stops the cheese from changing. As mentioned, the CFR provides standards for a number of pasteurized cheeses, but there are also many such cheeses that are non-standardized, allowing for additional ingredients and process modifications to meet finished product specifications. This includes functional properties such as restricted melt, enhanced flavor and controlled browning. Because of the ability to control functionality, most cheeses used in food processing tend to be pasteurized. The CFR provides a number of standards for pasteurized cheese based on total cheese solids content. This includes pasteurized process cheese, pasteurized process cheese food and pasteurized process cheese spread. Cold-pack and club cheese are also considered by many as process cheeses. These products are comminuted without the aid of heat. Process cheeses almost always requires the use of texturants and stabilizers. Clean-label native starches and select gums can assist with texture and melt management, without compromising key sensory attributes and consumers acceptance. One of the most recent innovative U.S. introductions comes from BC-USA. 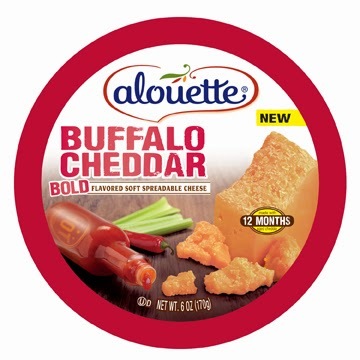 Its Alouette Cheese, America’s number-one spreadable cheese brand, introduced four exciting flavors to its product line: Smoky Jalapeño, Flame-Roasted Red Peppers, Buffalo Cheddar and Wasabi Cheddar Soft Spreadable Cheeses. 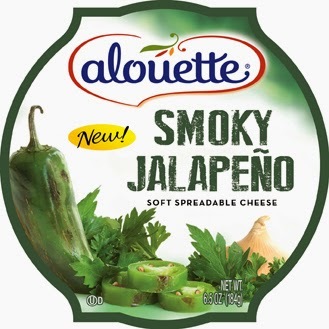 The Smoky Jalapeño Soft Spreadable Cheese features a unique blend of jalapeños, cilantro, onion and grilled charcoal notes, while the Flame-Roasted Red Peppers Soft Spreadable Cheese offers a combination of savory roasted red peppers, garlic and spices with grilled charcoal notes. Both products are ideal for dipping with veggies, pretzels or for spreading on your favorite cracker. 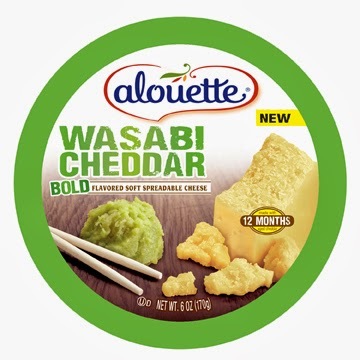 Spicing up the cheddar lineup, Buffalo Cheddar and Wasabi Cheddar Soft Spreadable Cheeses both feature vibrant flavors of 12-month-aged cheddar with a punch of heat, making them perfect for entertaining dips or for any-time snacking. Another innovative process cheese concept debuts under the Président brand. 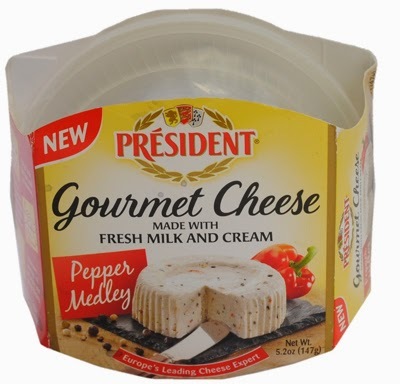 New Pepper Medley Gourmet Cheese is made according to a traditional European recipe that blends fresh milk and cream with a variety of peppers and other ingredients to produce an easy-to-spread creamy cheese. The product retails in a 5.2-ounce resealable pack. Look what is going on in Europe. 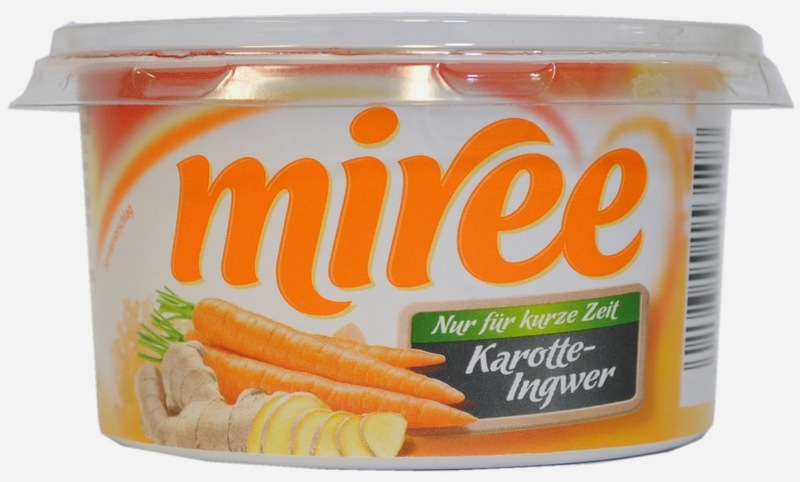 Miree Frischkäsezubereitung Karotte-Ingwer translates to a fresh cheese with carrot and ginger. Think bread spread. Imagine serving a dollop as a garnish in a bowl of chicken dumpling soup. 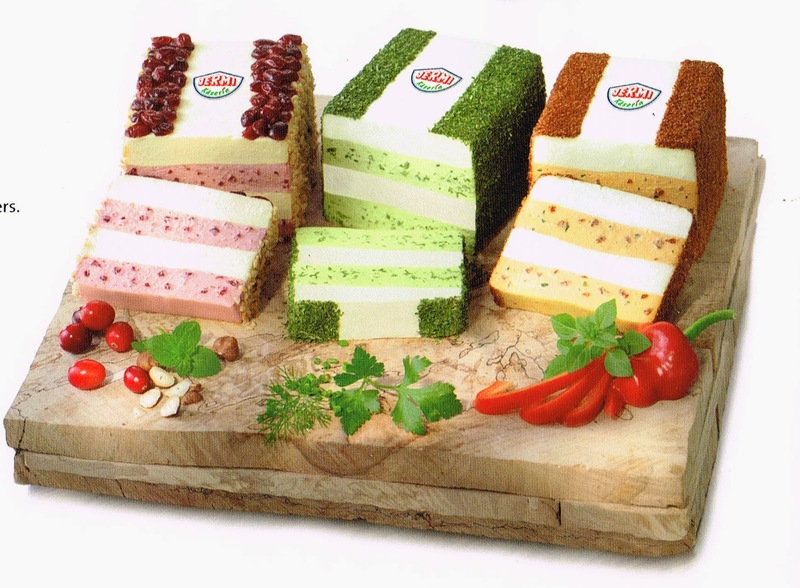 Jermi Kasewerk GmbH recently introduced a cream cheese pate for the deli or cheese department. Consumers get a slice cut to order. 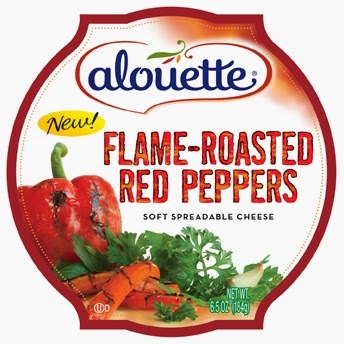 The spreadable cheese comes in a variety of alternate flavored layers, including layers based on herbs, peppers and tomatoes. 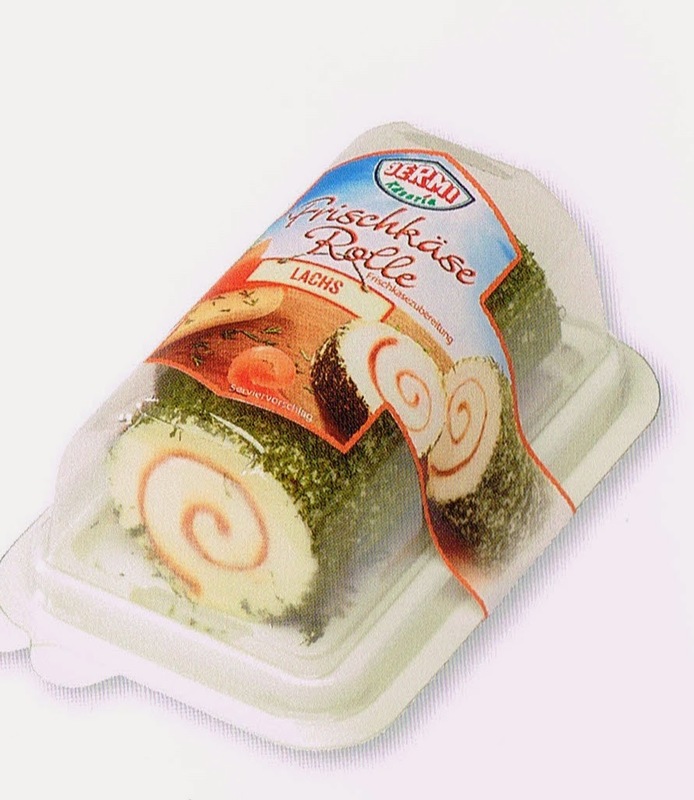 The company also offers packaged cream cheese rolls. These spreads include a swirl of flavor. Varieties are: Herbs, Red Pepper, Pepper, Pineapple & Almond, and Salmon with Dill. 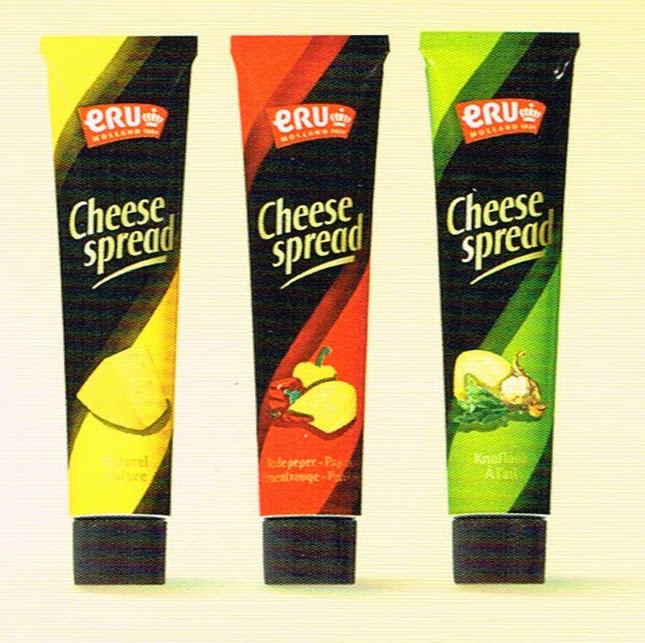 Eru has been a leading Dutch producer of process cheese since 1824. The company shows us just how innovative this category can be. 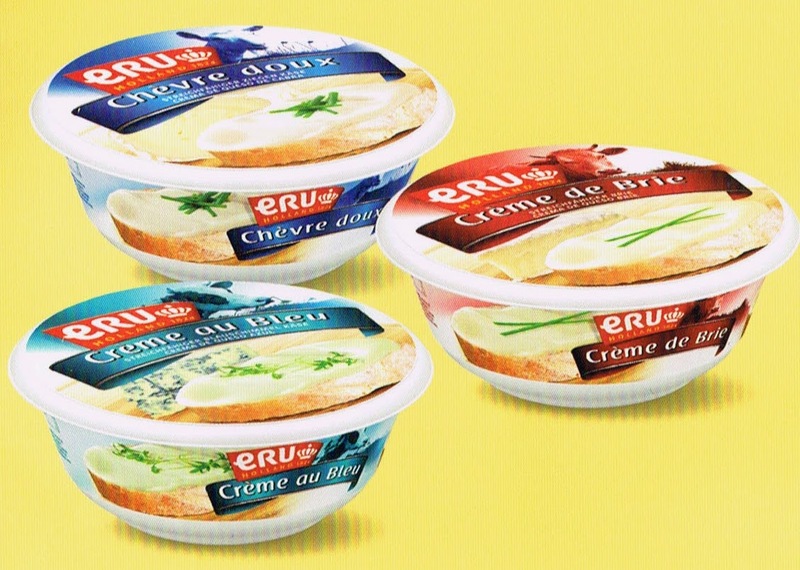 Its lineup includes everything from basic soft cheese spreads, to those enhanced with yogurt, lower in sodium or made with premium cheeses such as brie and bleu. The company even puts cheese in a tube, a convenient form for consumers on the go. Finally, process cheese manufacturing allows for the formation of interesting shapes and figures, as the cheese starts out in a molten form that easily pours into molds. 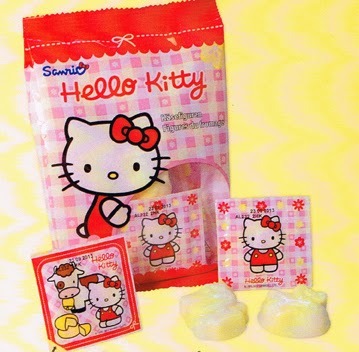 This Hello Kitty concept comes from Holland's Anker Cheese. The company has two different Hello Kitty figures...but the options are infinite. Here are some interesting happenings in the industry. As many of you read this, I will be speaking to a room full of dairy processors and their suppliers at the All Star Dairy Association annual convention in Orlando. During my session, “Take Your Head Out of the Sand,” I will encourage processors to stop hiding from change and to embrace innovation, especially in the fluid milk category. I will also share inspiration gained earlier in the week at IRI Summit 2014, also in Orlando. I was one of the few fortunate trade press editors to attend this annual convention hosted by Information Resources Inc. (IRI). The inspiration came from respected author and consultant Jason Jennings, who shared with summit attendees the five growth secrets of the world’s best-performing companies and leaders. Space does not allow me to share all five secrets…plus, they are Jennings’ secrets to share and he does such a fabulous job at it. But I must share two of them that really hit home…and really talk to the dairy industry. There are many parts to letting go, but the one that stood out is “if all you employ is conventional wisdom, all you will achieve is conventional results.” Jennings said that when you let go, you are better able to deal with change. Letting go allows for innovation to take place and for you to stay focused. This wisdom MUST be applied to the fluid milk category. Conventional wisdom is that consumers will drink more milk if we simply tell them how good it is. Processors need to do their part by offering unique flavors, packages and nutritional improvements. Do not take the “change is great but you go first” approach. Do something today. If you want to hear more, consider attending IDFA’s Milk and Cultured Dairy Conference on May 20 to 21 in Indianapolis. I will be presenting on the second day at 1:30 and will be discussing innovations in…you guessed it…milk and cultured products. This reminds me of my friend Gary Hirshberg, chairman and former president and CEO of Stonyfield Farm. When I first started writing for the dairy industry, I was impressed how Gary was one of the few dairy marketers who would talk to any and every editor, regardless if they wrote for the consumer or trade press. He had nothing to hide. He only wanted to share his passion and enthusiasm for spreading the word about the healthfulness of yogurt. I remember when he was on a consumer media tour in Chicago when the Windy City got its first Whole Foods Market in the mid-90s. We had previously chatted on the phone a few times and he wanted to make sure we met in person to further spread the word about the power of yogurt. I remember Gary saying that everyone in the dairy business wins when consumers buy more dairy, regardless of the brand. That is stewardship. Stewardship is alive and thriving at the All Star Dairy Convention. Wednesday night at the opening reception I shared this stewardship concept with another good friend, Randy Rich, president of Rich Ice Cream Company. He agreed, citing an example of how he often solicits suggestions and recommendations from the owners of competitive brands. The brands might be competing in the marketplace, but the owners of these brands share the common interest of growing the dairy category. We all need to take this approach to business. Other qualities of a good steward, according to Jennings, include being accessible to your employees, getting your hands dirty, standing for something, being a coach and a mentor and eliminating superficial distinctions. “It is important to remember that knowledge is no longer power, execution is,” he said. So true! The first list was announced at the IRI Summit. It’s IRI’s 2013 New Product Pacesetters. By now you probably have read that dairy brands fared well in this annual report. You can read the complete announcement and explanation of determination of winners HERE. The other list is quite different. It came from private-label discount retailer ALDI. 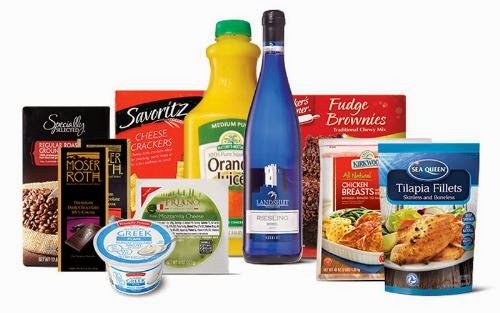 In the first-ever ALDI Fan Favorites poll, shoppers selected 10 food and beverage items as their must-have, best-loved ALDI exclusive brand products. Two of them were dairy foods. In the online poll of 4,021 respondents, Friendly Farms Greek Yogurt ranked #1 in the Best Breakfast category. This nonfat yogurt comes in 6-ounce cups and retails for 85 cents. The #1 Cheese item is Priano Fresh Mozzarella. Made with fresh milk that provides a delicate flavor with a creamy, soft texture, an 8-ounce ball retails for $2.69. Speaking of ALDI, this retailer has big plans for the near future. Before I arrived in Orlando, I was in Mickey Mouse’s original home base--Anaheim—for the Natural Products Expo West show. At the expo, Natural Marketing Institute and The Nielsen Company presented “Game Changers, Future Trends in Health and Sustainability.” Speakers confirmed what most food and beverage marketers have long suspected—the retail landscape is changing as consumers demand more in terms of convenience and value from the fresh and packaged foods they purchase through supermarkets and related channels. I wrote an overview of this presentation for Food Business News, including a slide show of tables and charts. You can view it HERE. Back to innovation, many of the new trends in dessert flavors, textures and ingredients have their roots in the kitchens of top restaurants across the country. Chefs who experiment for a living are contributing to the rapid expansion of ice cream and frozen dessert flavors and product lines. At this year’s IDFA Ice Cream Technology Conference, you can learn what inspires Chef Christina Tosi to create the original desserts and snacks that has earned the Momofuku Milk Bar the reputation as “one of the most exciting bakeries in the country,” according to Bon Appetit. I will also be kicking off the conference with my presentation: Ice Cream Trends for 2014 and Beyond. Please join me while I explore global research on consumer behaviors and eating habits. This session will help you identify the mega and micro trends that will influence ice cream innovations. 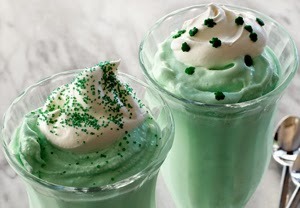 Ice Cream Tech will be held April 8 to 9 in St. Petersburg, FL. For more information, visit HERE. To wrap things up, let’s do some name calling. To read more about why U.S. cheesemakers should be able to call feta cheese feta and parmesan cheese parmesan, visit HERE. Last week in this space I wrote about FDA’s proposed changes to the Nutrition Facts label. I specifically addressed the addition of an “Added sugars” line under the “Sugars” declaration and how the dairy industry should look at this as an opportunity to make labels more appealing. If you missed the blog, you can read it HERE. In FDA’s very lengthy report, which can be accessed HERE, fiber is discussed in great detail; however most articles—consumer and business—did not pick up on this important item of discussion. I learned of it in a press release from the Center for Science in the Public Interest (CSPI), a.k.a., the food police. The press release can be accessed HERE. In the release, CSPI gave FDA high marks for proposing that the “fiber” listed on Nutrition Facts labels exclude purified, isolated fiber food ingredients, also often referred to as novel fibers. CSPI believes that such added fibers are not as beneficial as intact, unprocessed fiber that one gets through the consumption of whole foods. Now, this may or may not be true, as there is little documented research in this area, according to my friend Roger Clemens, DrPH., former president of the Institute of Food Technologists, a member of the 2010 Dietary Guidelines Advisory Committee and current adjunct professor with Pharmacology & Pharmaceutical Sciences at the University of Southern California School of Pharmacy in Los Angeles and associated director of the International Center for Regulatory Science at the same location. He is quick to point out that for those who have forgotten, fiber was identified as one of four nutrients of concern in the American diet in the Dietary Guidelines for Americans, 2010, report. Dietary fiber that occurs naturally in foods may help reduce the risk of cardiovascular disease, obesity and type 2 diabetes. Children and adults should consume foods naturally high in dietary fiber in order to increase nutrient density, promote healthy lipid profiles and glucose tolerance, and ensure normal gastrointestinal function. Fiber is sometimes added to foods and it is unclear if added fiber provides the same health benefits as naturally occurring sources. The established Adequate Intake (AI) for fiber is 14 grams per 1,000 calories, or 25 grams per day for women and 38 grams per day for men. Most Americans greatly under consume dietary fiber, and usual intake averages only 15 grams per day. The health benefits of isolated fibers are still unclear. Research suggests they may not have the same effects as the intact fibers found in whole foods. For instance, there’s little evidence that isolated fibers help lower blood cholesterol, and they have differing effects on regularity. On the plus side, some studies suggest that inulin, an isolated fiber from chicory root, might boost the growth of good bacteria in the colon. The bottom line is that most of us need to fit more fiber into our day, no matter what its source. It is a disservice to Americans to exclude fiber food ingredients from being part of the fiber line on the Nutrition Facts. These ingredients will help Americans close in on the fiber gap of what’s recommended and what is consumed. The public health implications of inadequate fiber intake prompted the formation of an October 2011 roundtable meeting of nutrition researchers, educators and communicators entitled “Filling America’s Fiber Gap: Probing Realistic Solutions.” The meeting was sponsored by Kellogg Company and a synopsis of the meeting appeared in print in the July 2012 issue of The Journal of Nutrition. Prior to the roundtable, Kellogg published a report entitled “Closing America’s Fiber Gap with Options and Variety” in 2011. The report can be accessed HERE. With low fiber intakes, consumers need a variety of options to help them bridge the fiber gap. In addition to encouraging consumption of fruits, vegetables, legumes and whole grains that are a good source of fiber, adding fiber to lower-fiber grain foods that people already like and eat is a practical solution to meet fiber recommendations without adding significant calories to the diet. The company explains that functional or novel added fibers comprise isolated and synthesized (mostly through fermentation technology), non-digestible carbohydrates that have beneficial physiological effects in humans, and further explains that there is significant scientific evidence for the benefits of added fiber. In fact, most clinical studies of fiber’s physiological benefits have been conducted with added fiber, not with whole, fiber-containing foods. While they often have complex technical names, added fibers are frequently derived from natural sources. Beta-glucan, for example, is typically derived from oats and barley while oligofructose and inulin are derived from foods such as chicory root and Jerusalem artichoke. Additionally, commonly used isolated fibers, like oat fibers, are also considered “added fibers” when they are removed from one food source and put into another. Adding fiber to grain products is not a new concept, as many bread and cereal manufacturers have included oat fiber, beta-glucan and psyllium in their product formulations for many years. FDA even allows an on-pack health claim that highlights the role of foods containing beta-glucan and psyllium, whether naturally occurring or added, in reducing the risk of heart disease. What is a 21st century phenomena is the inclusion of novel fiber food ingredients such as inulin, soluble corn fiber and resistant maltodextrin. These fiber ingredients have application in many dairy foods. Not only can they boost the fiber content of these foods, they can assist with the reduction of calories and fat. This is food science in action and such progress should be embraced for the wellbeing of Americans. Check out these new dairy product innovations touting their fiber content. YoCrunch Yopa! 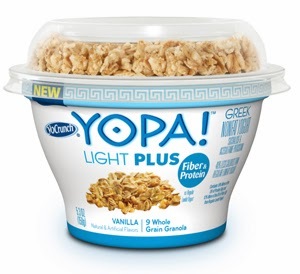 Light Plus Fiber & Protein Greek Yogurt with 9 Whole Grain Granola contains chicory root and soluble corn fiber. Each 5.3-ounce container touts 3 grams of fiber. Chobani’s Simply 100 Greek Yogurt is a 100-calorie authentic strained Greek Yogurt that provides 5 grams of fiber per 5.3 ounce container. The source of fiber is chicory root fiber. 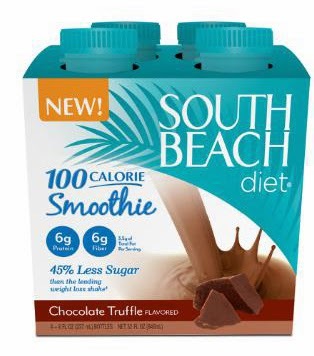 South Beach Diet 100 Calorie Chocolate Truffle Smoothie is packed with 6 grams of both protein and fiber, with the latter from the addition of soluble corn fiber. 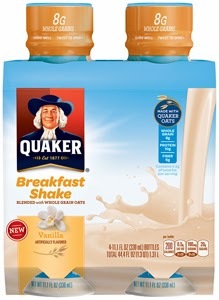 The new Quaker Breakfast Shake contains 6 grams of fiber in every 11.1-fluid-ounce bottle. The fiber comes from a combination of whole oat flour, polydextrose and hydrocolloids. "Isolated novel fiber ingredients do differ in physical characteristics, chemical nature and physiological responses when fed to (infants) and consumed by (adult) humans. Part of the educational challenge is conveying those differences while embracing those differences. This is one of the challenges with beta-glucans. Most people (at least consumers) think all beta-glucans are from grains and that they help reduce blood cholesterol. Yet, we know that beta-glucans from other sources, such as yeast and mushrooms, function differently because of their innate structural differences. These beta-glucans impact the immune system via activation of several complement receptors associated with specific types of white blood cells (macrophage, neutrophil) and do not have any effect on cholesterol. Evidence suggests that chain-length (degree of polymerization) makes a difference with respect to gut microflora’s response to certain ingested fibers. Further, depending on one’s microflora (microbiome) profile, the anticipated response can also differ." Bottom line is that fiber added to foods by a manufacturer represents a good start, an important start, to help bridge the fiber gap.